Another amazing weekend at the Circuit of the Americas in the fun fun city of Austin "Keep Austin Weird" Texas! 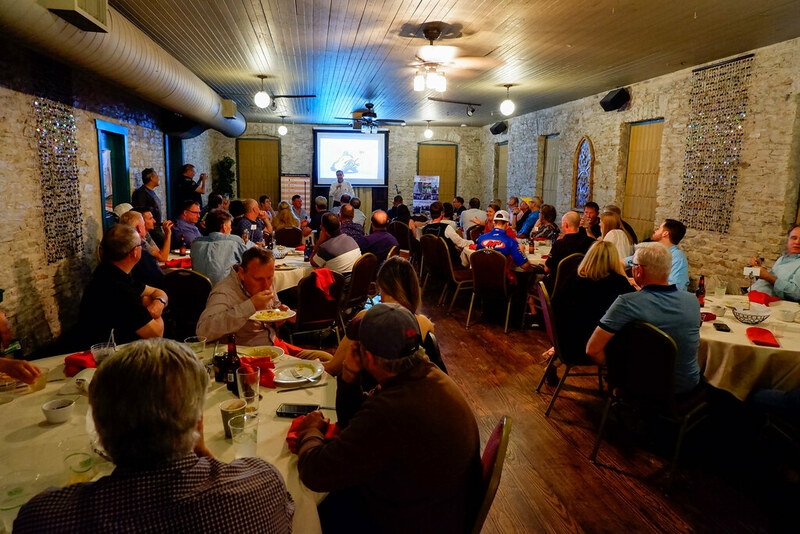 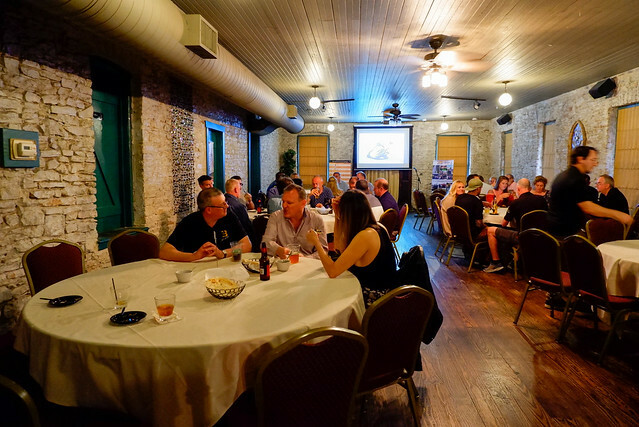 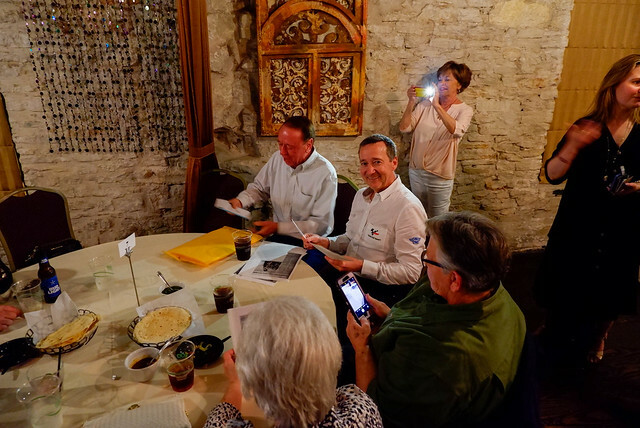 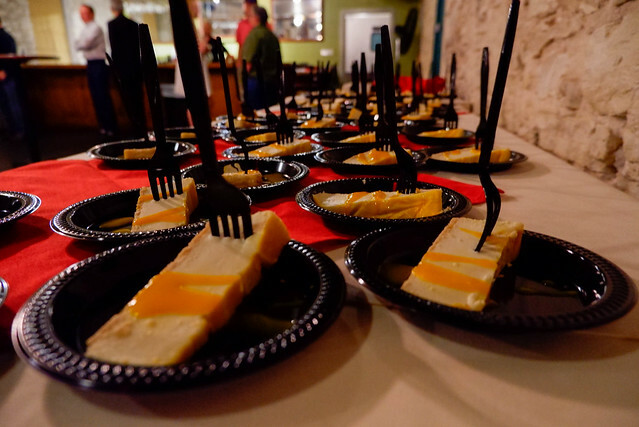 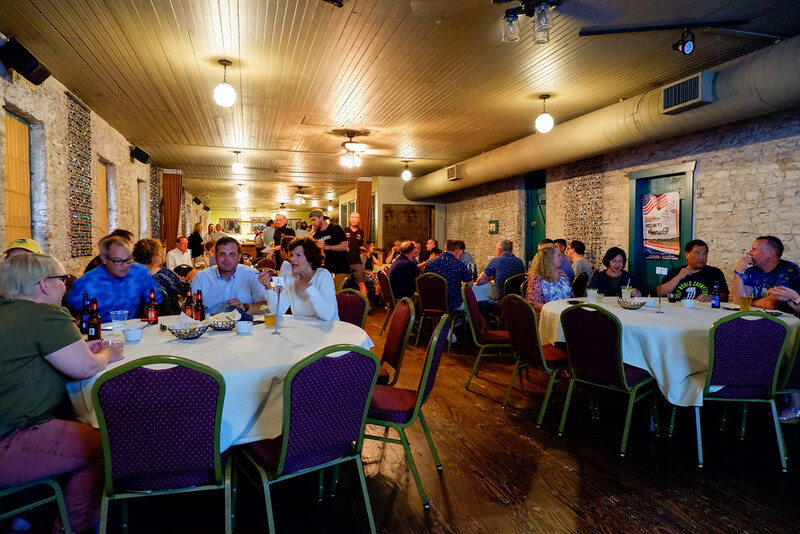 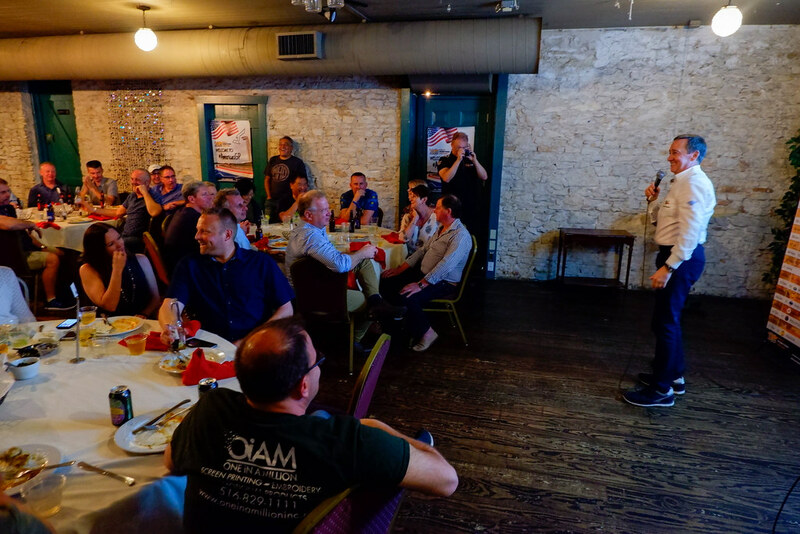 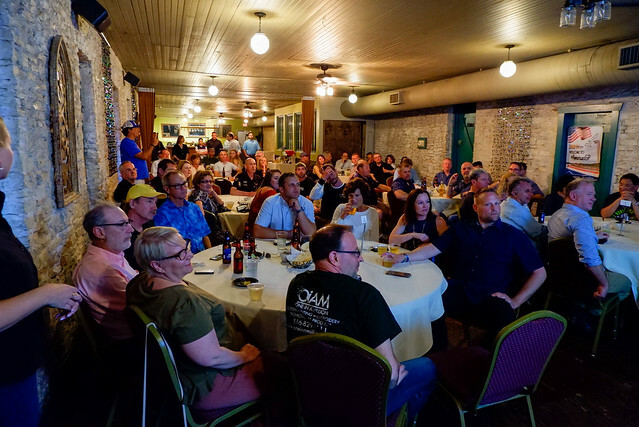 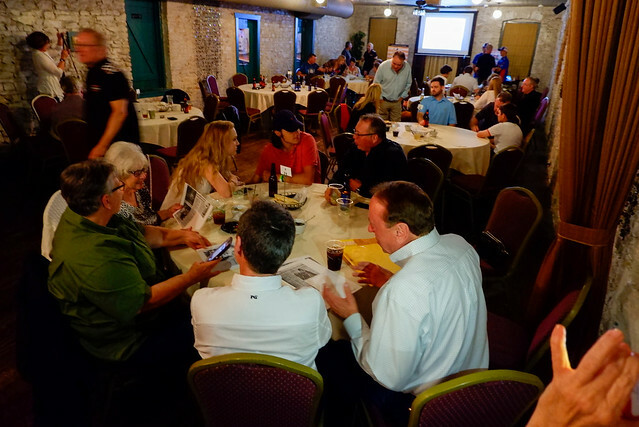 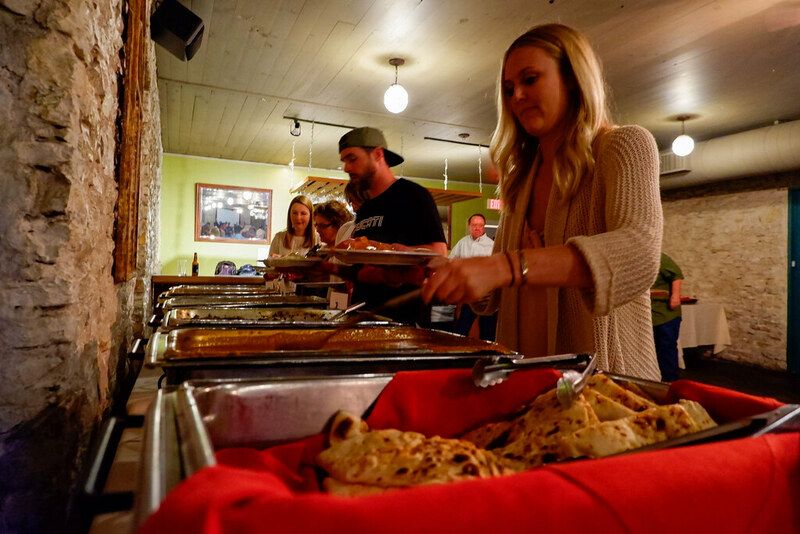 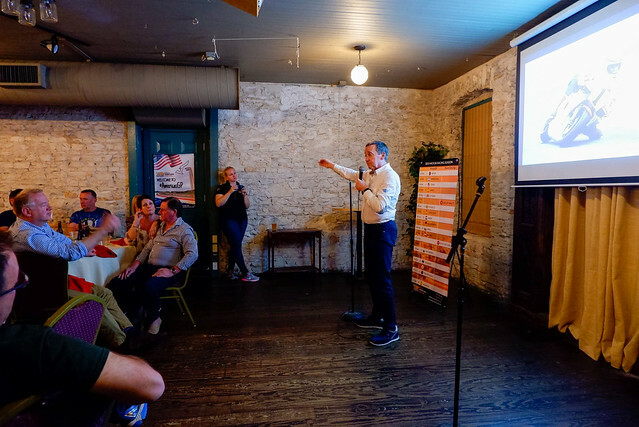 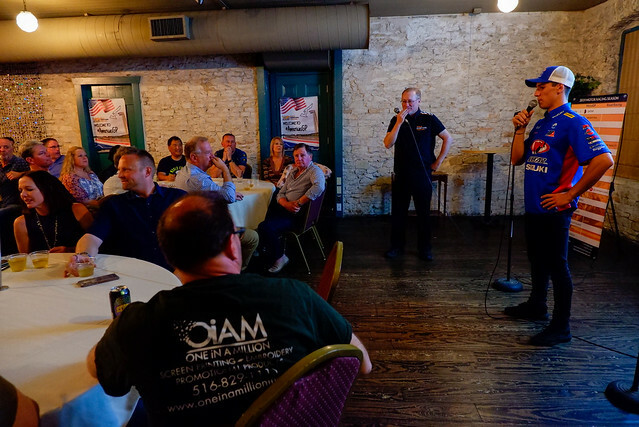 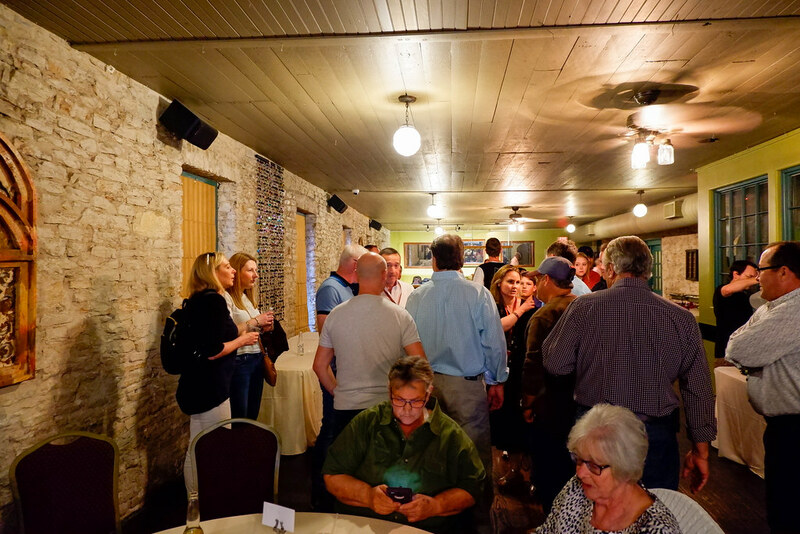 We started with our traditional "happy hours" Thursday evening; we met in our hotels then headed out to one of Austin's classic hidden pubs: The Dive Bar -- just what we were looking for! 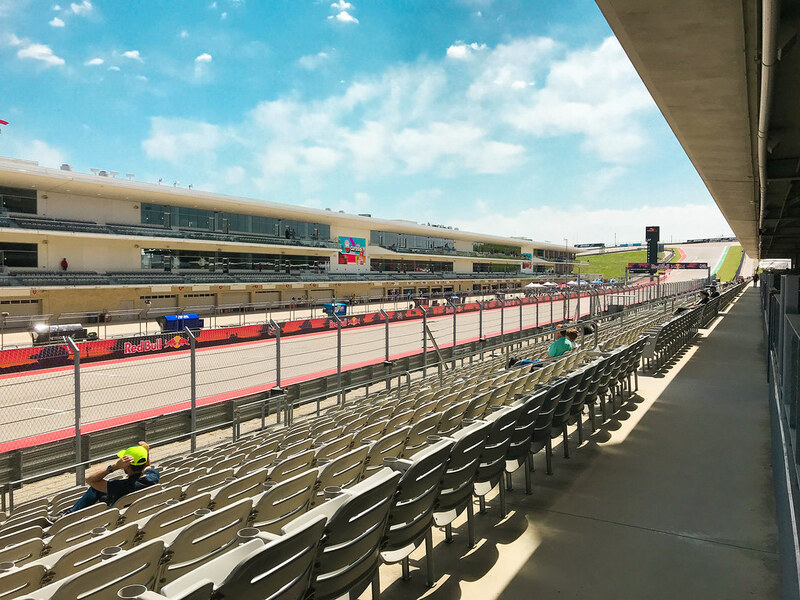 Friday was a perfect day at the track. 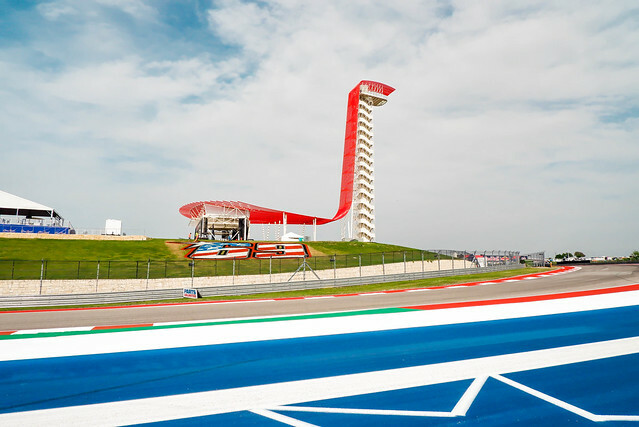 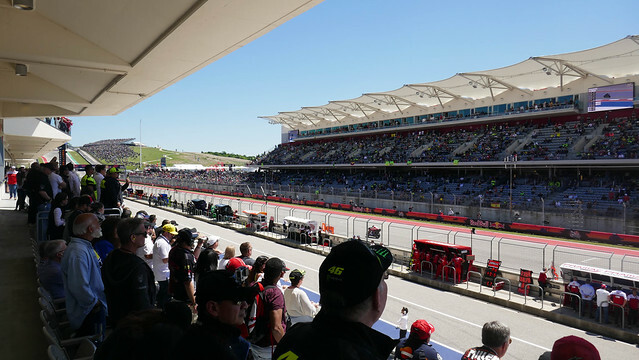 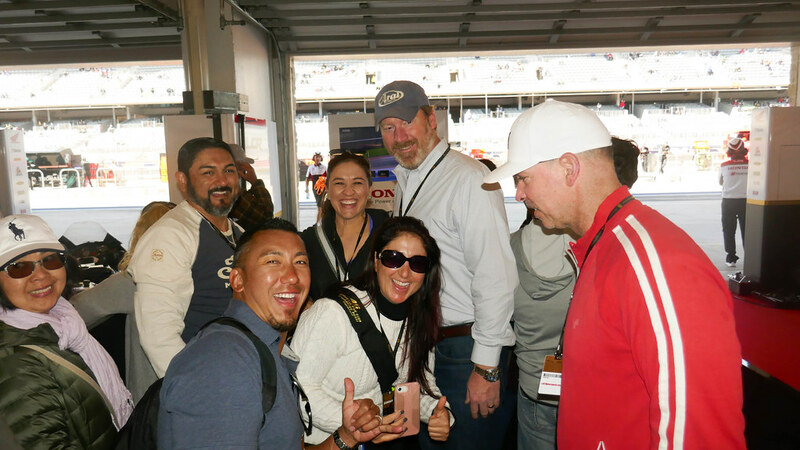 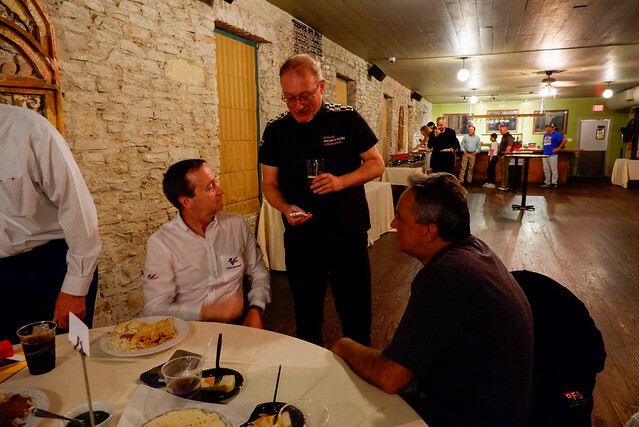 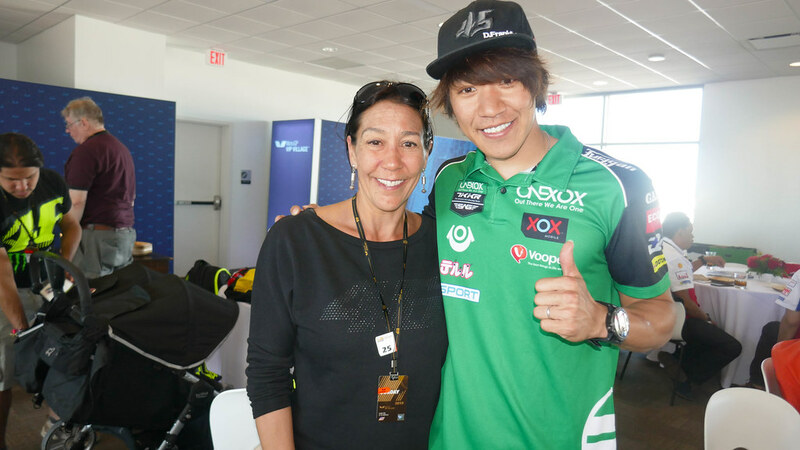 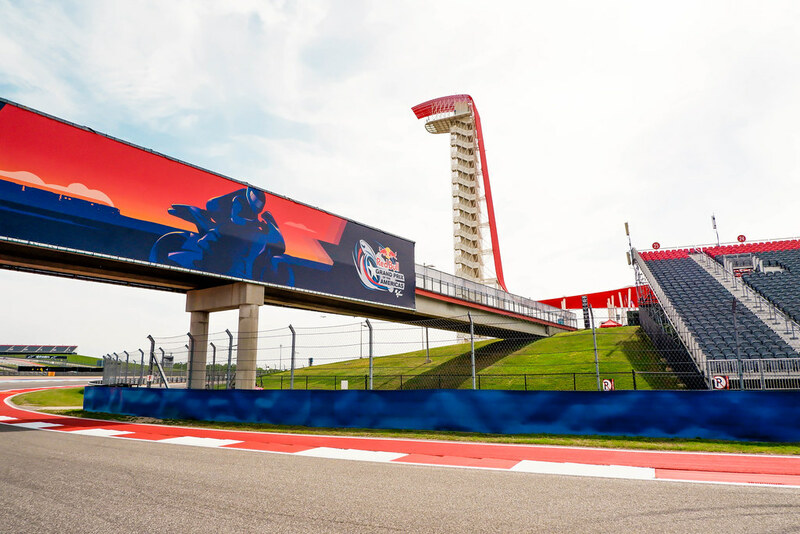 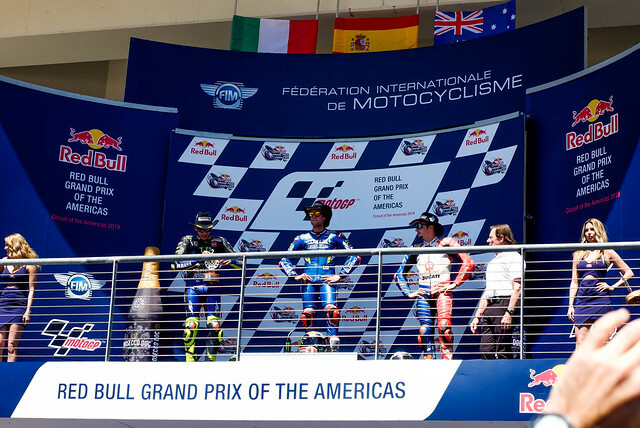 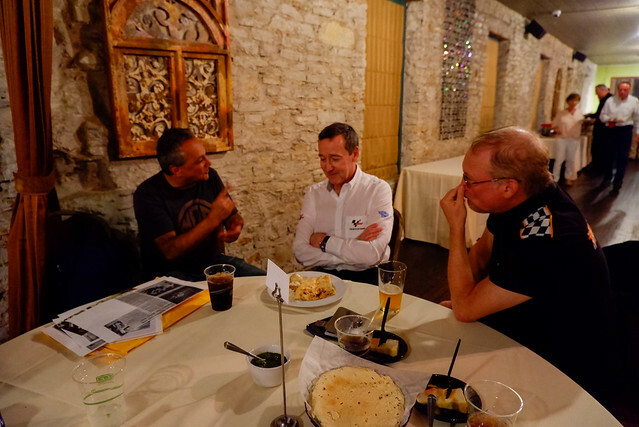 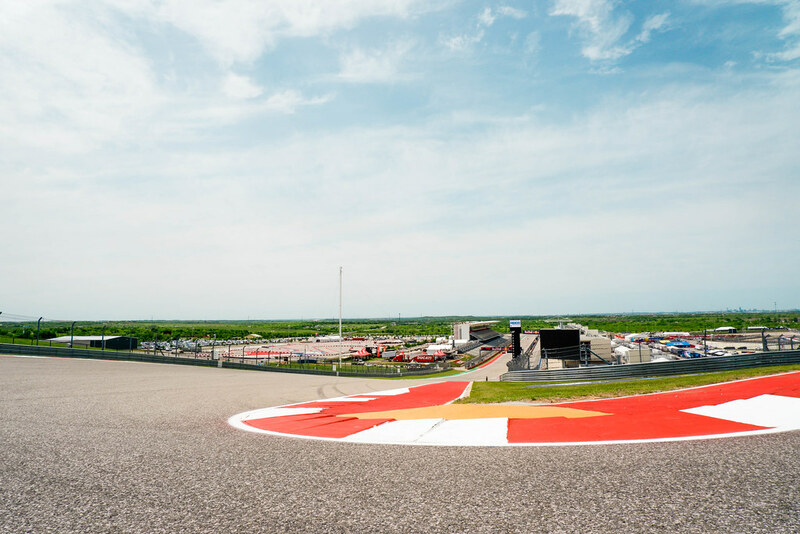 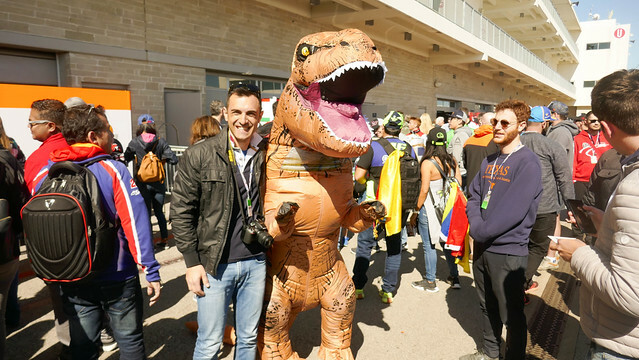 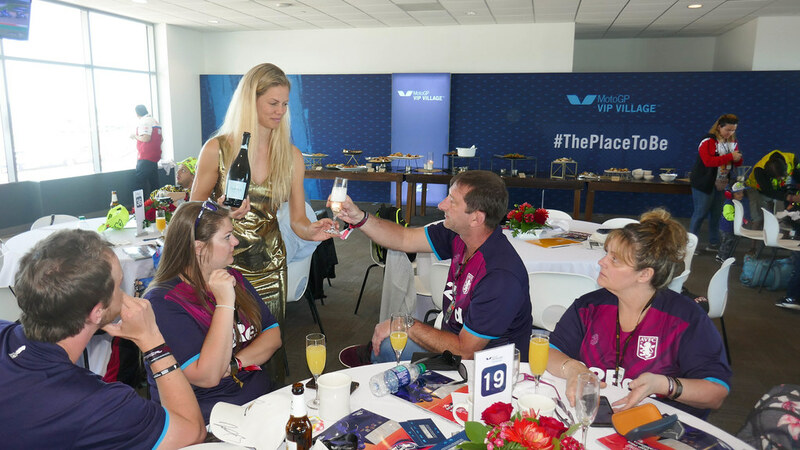 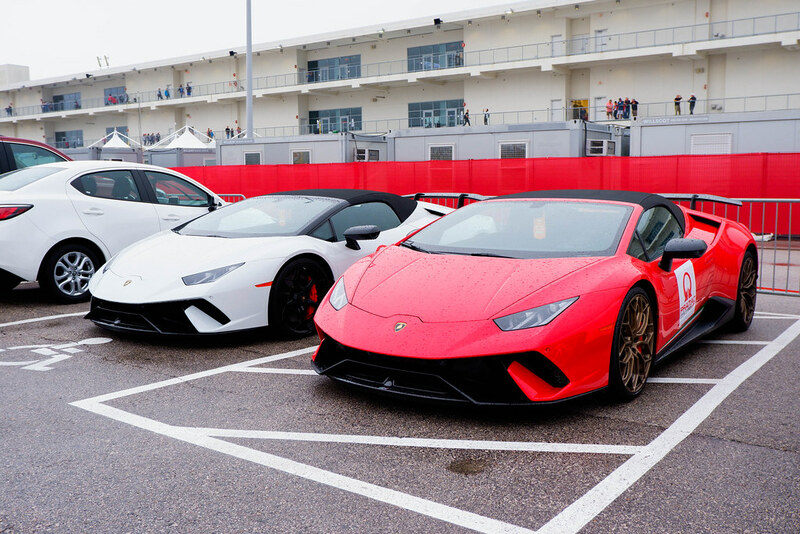 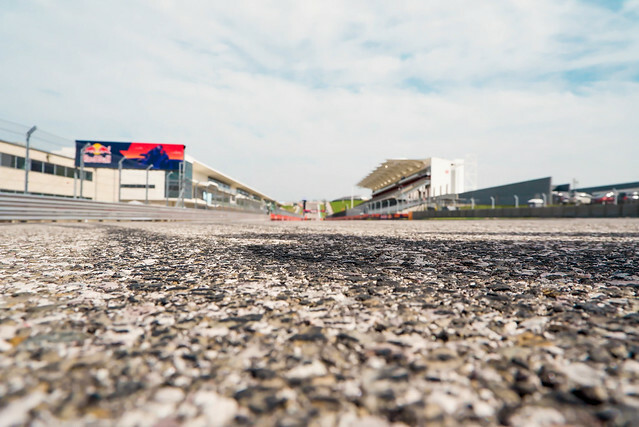 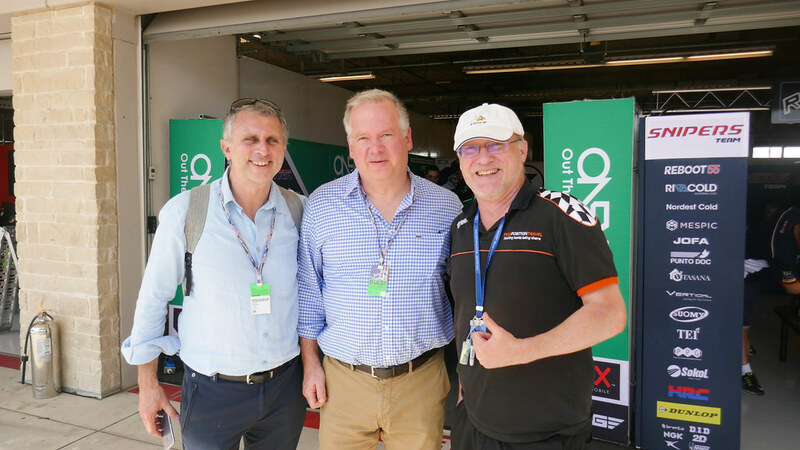 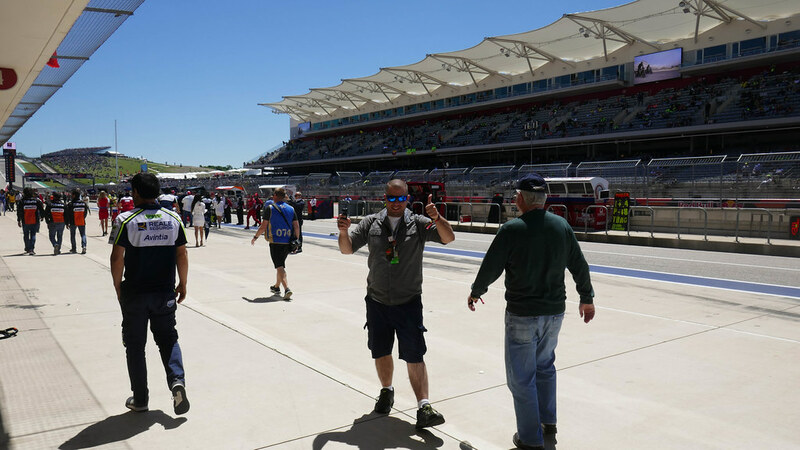 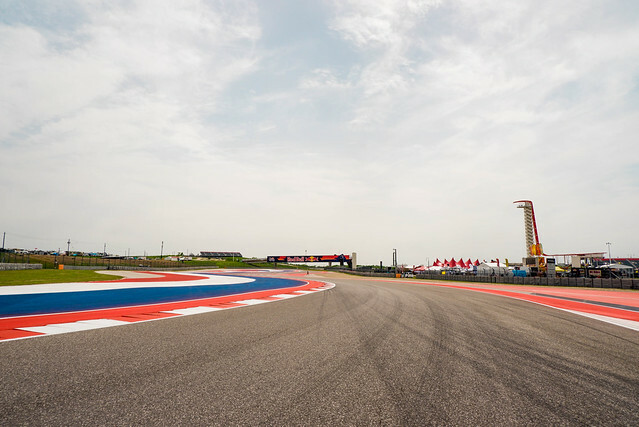 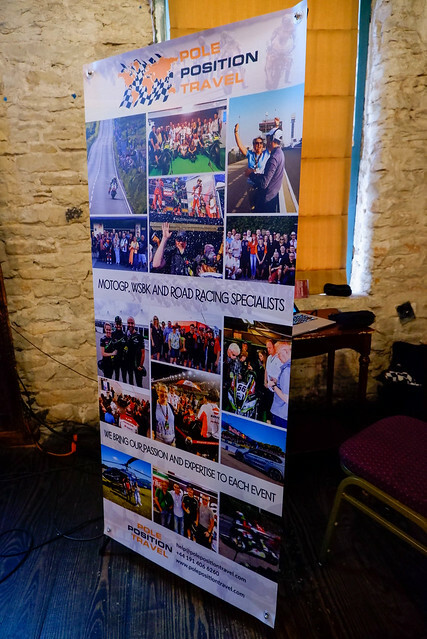 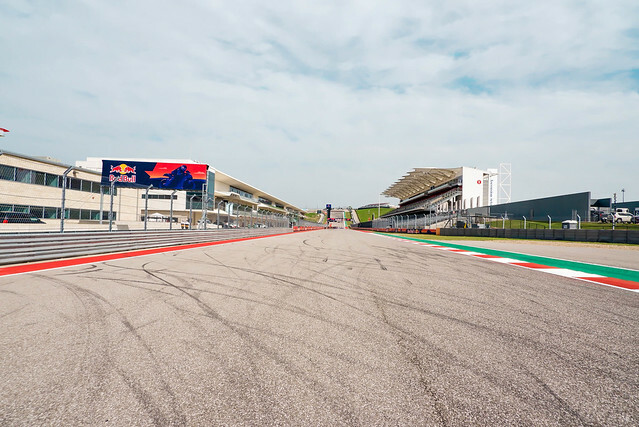 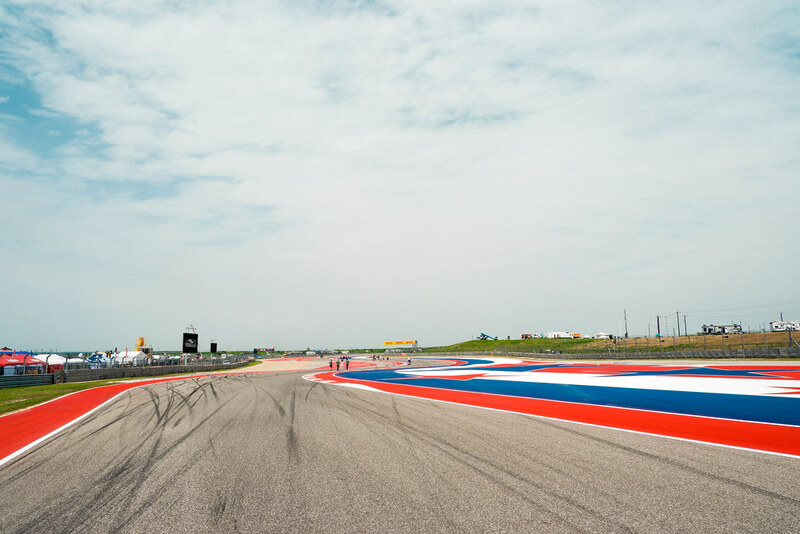 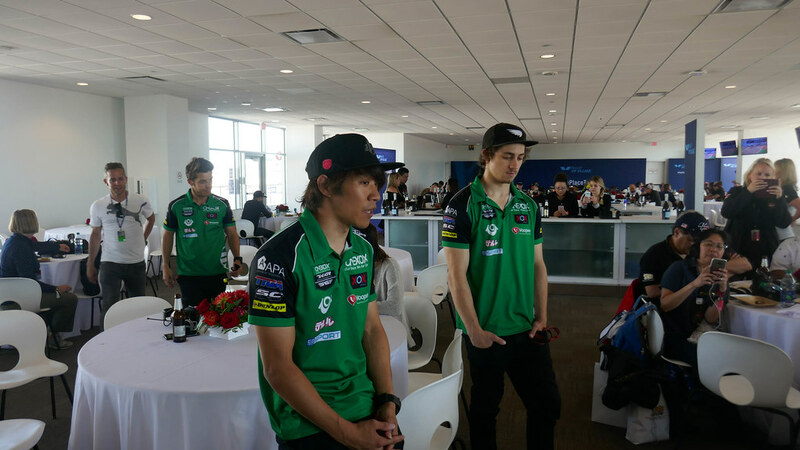 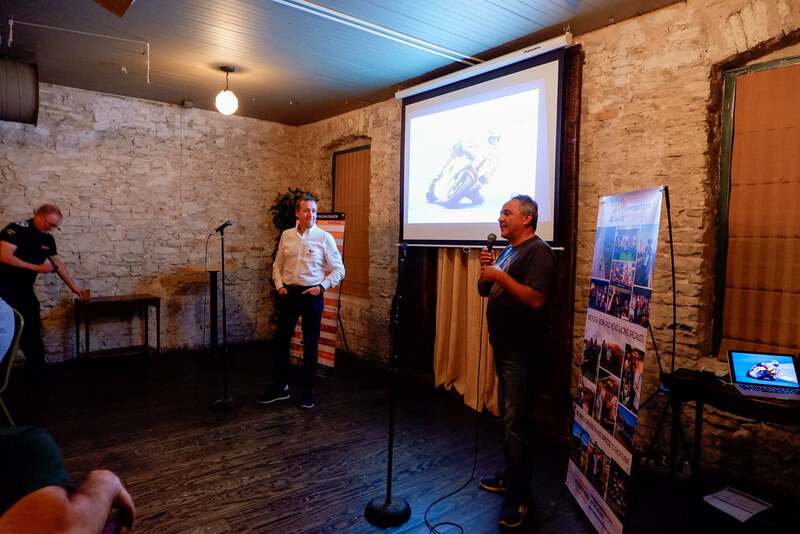 ost of our guests had paddock access owing to the VIP Village (or Team Experiences) and this was the perfect opportunity to visit garages, nobble riders, or roam the vast track area, merchandise villages or ascend the awesome COTA Tower! We have been looking forward to the Friday night dinner for many months! 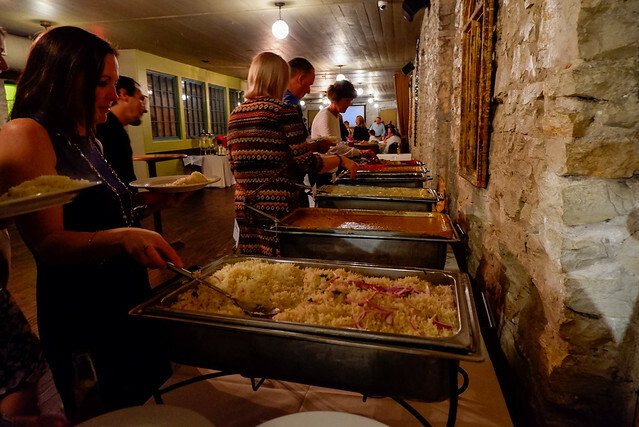 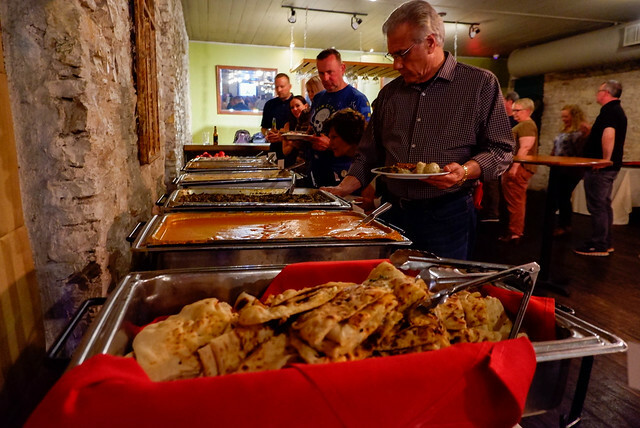 Apart from the superb meal from the top Indian restaurant in Austin (and free flowing beer & wine! 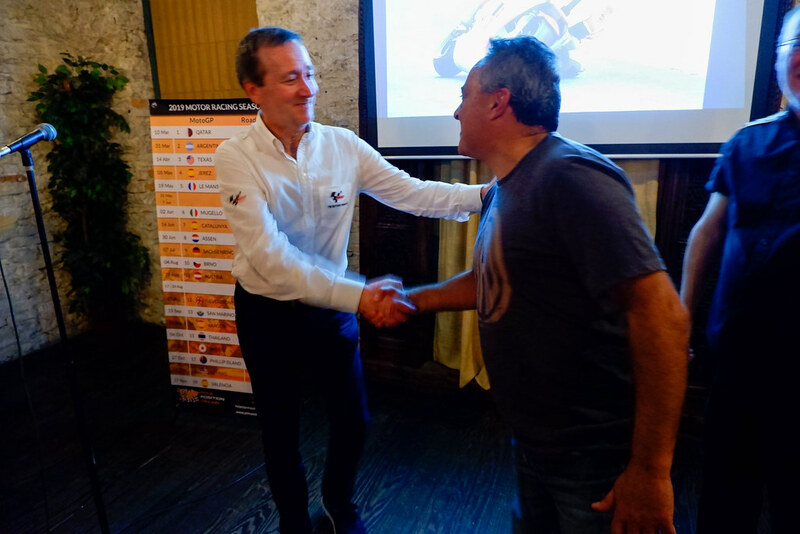 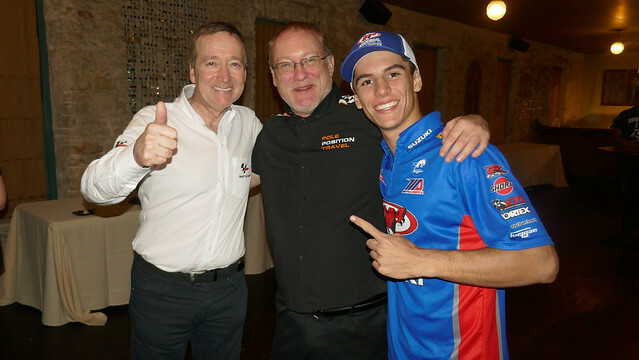 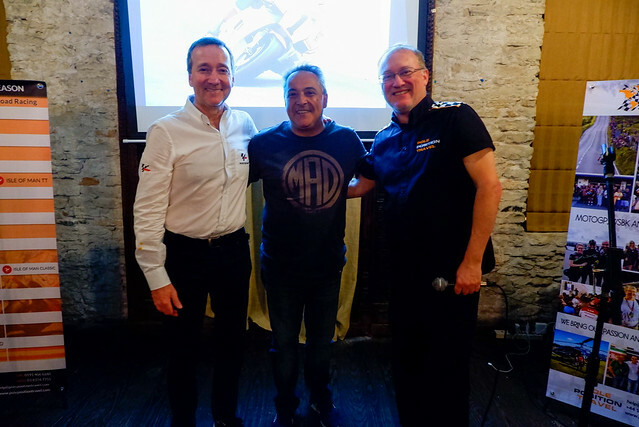 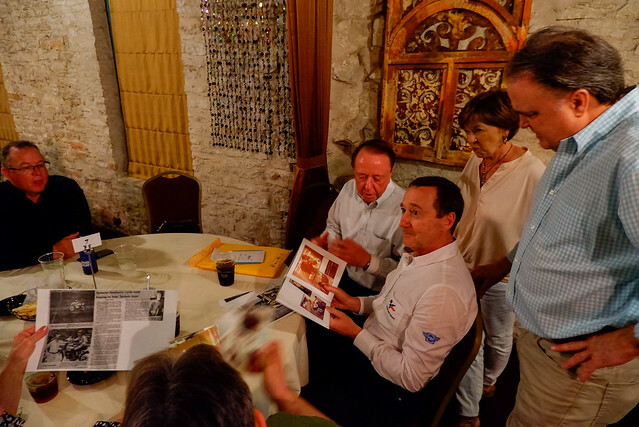 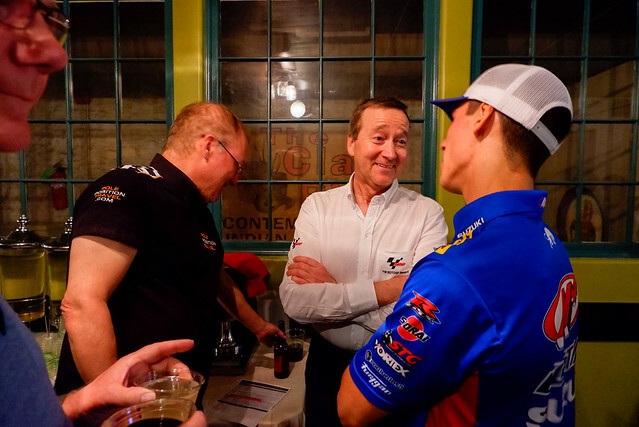 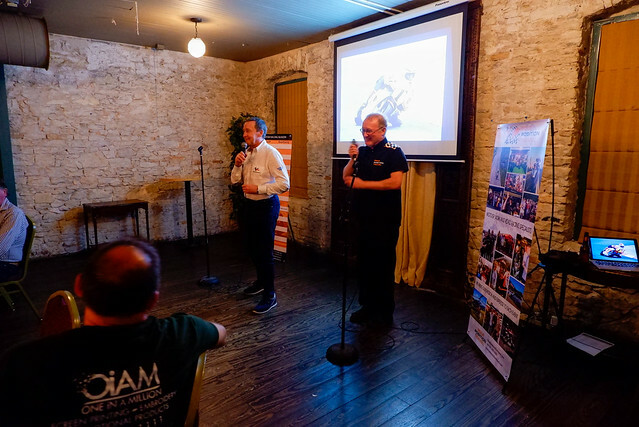 ), we were honoured by the presence of American MotoGP legend Freddie Spencer. 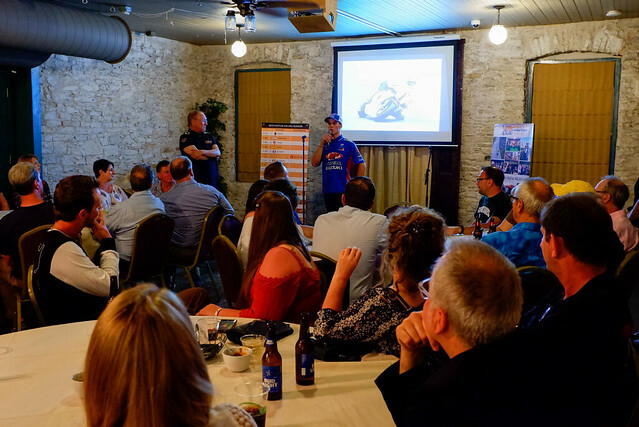 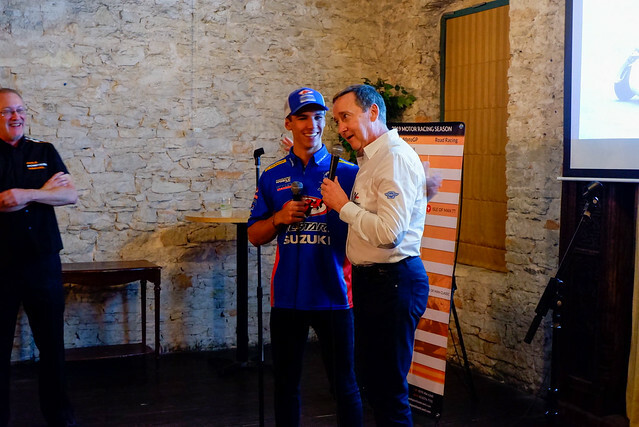 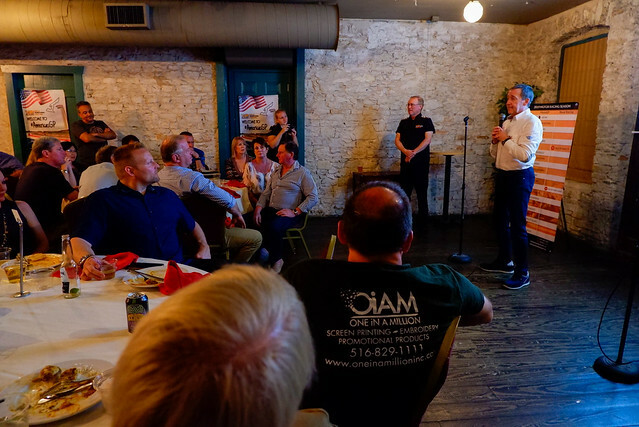 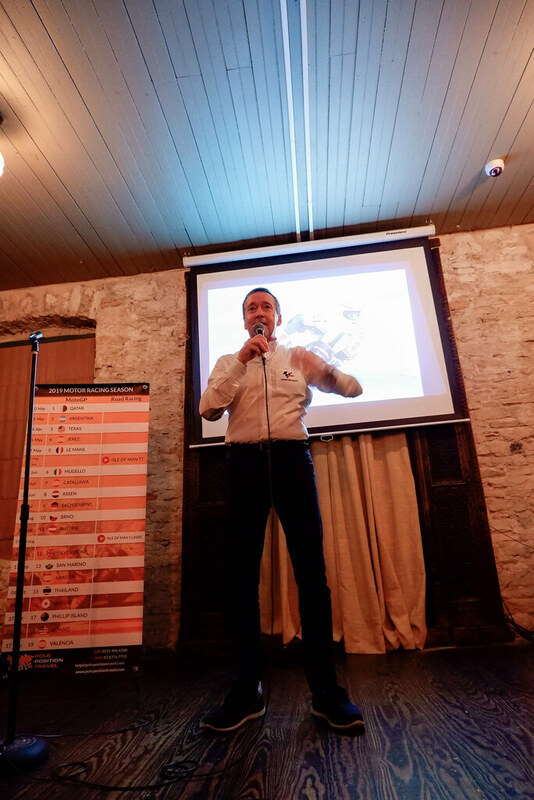 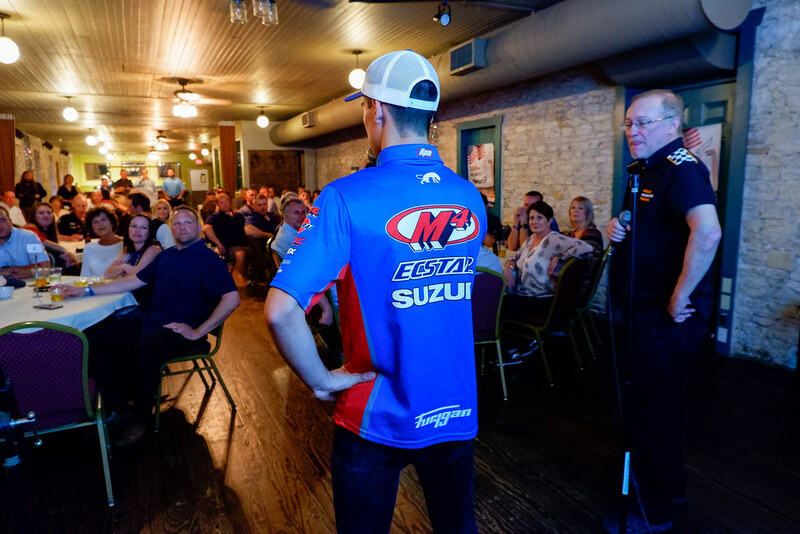 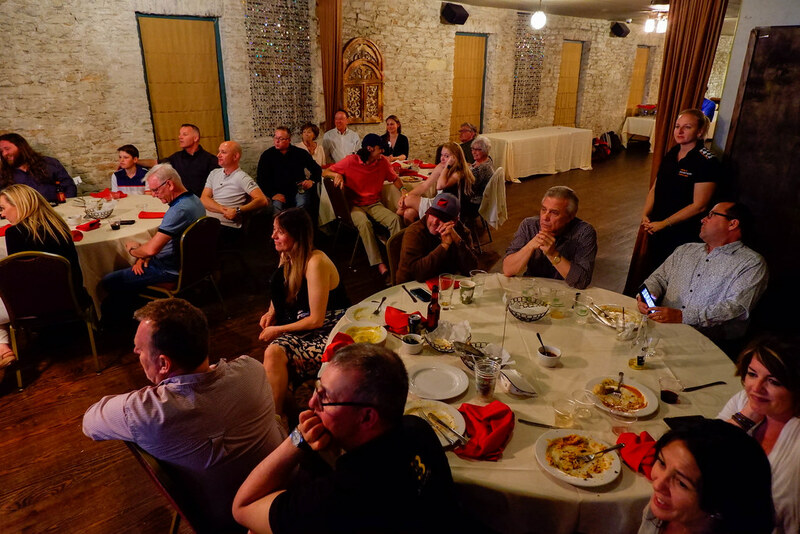 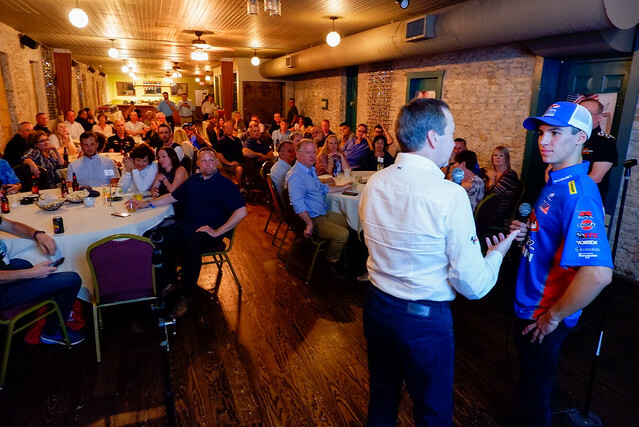 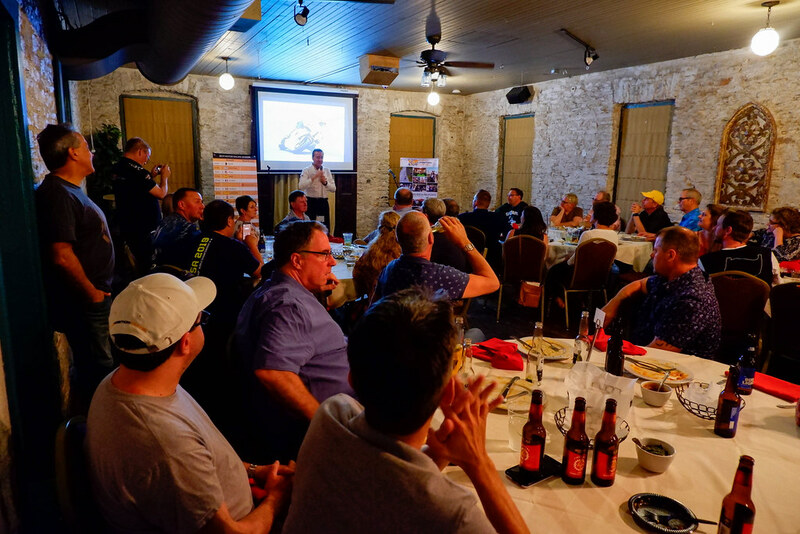 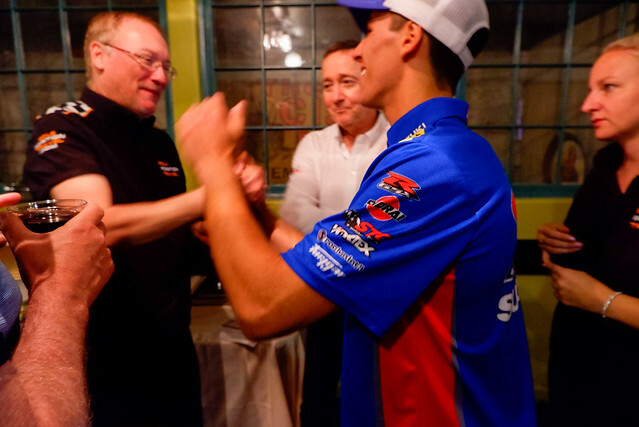 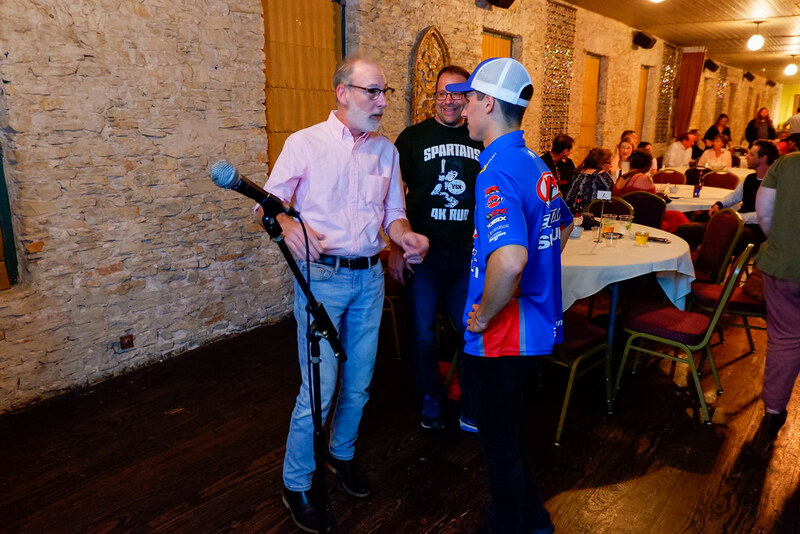 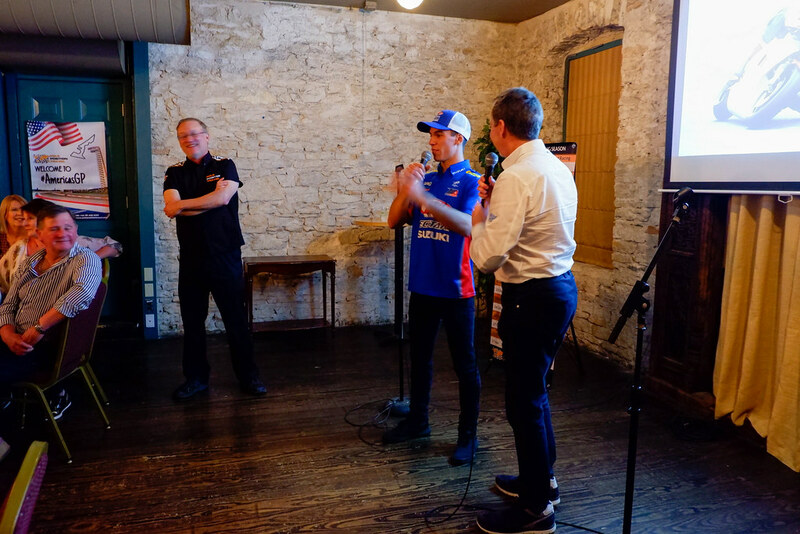 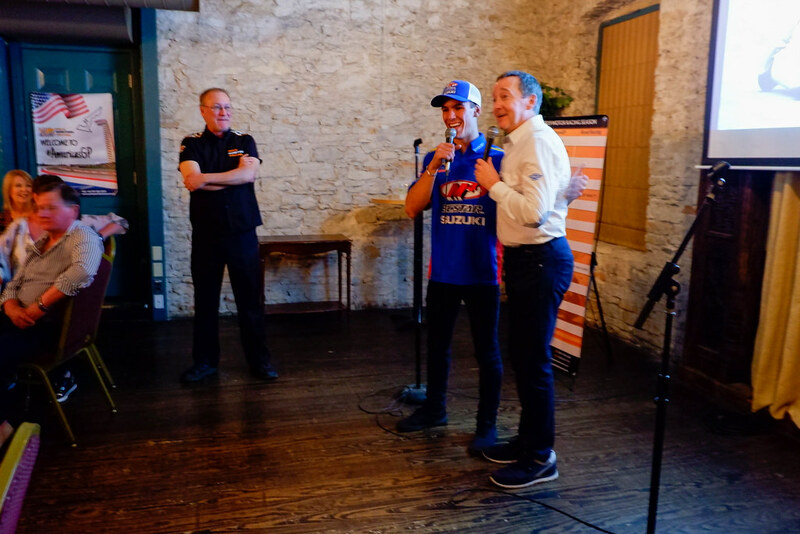 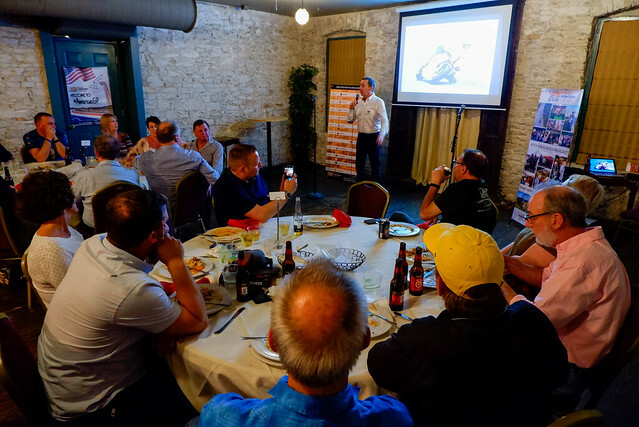 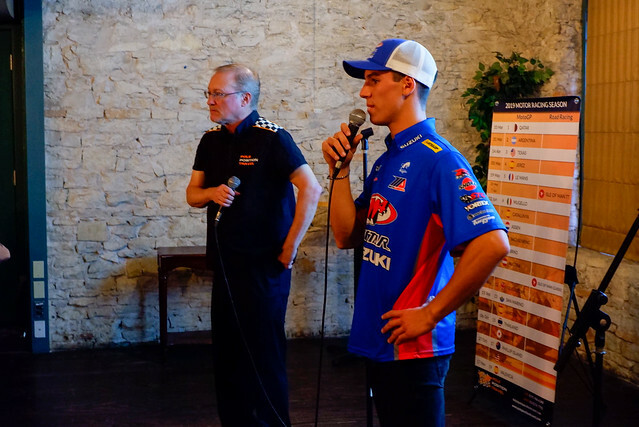 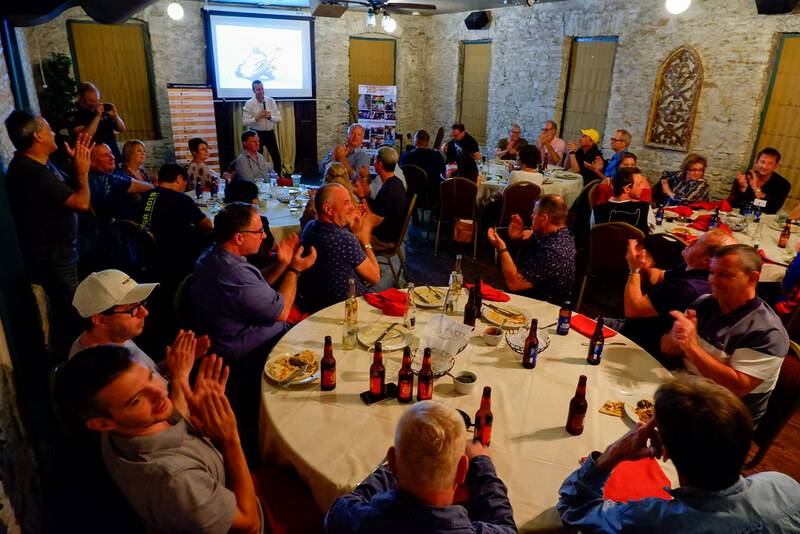 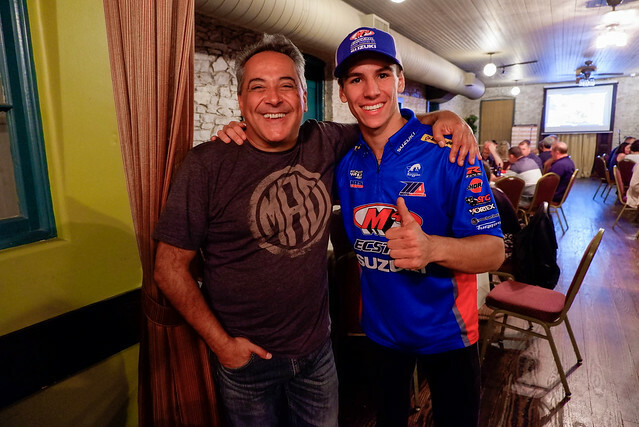 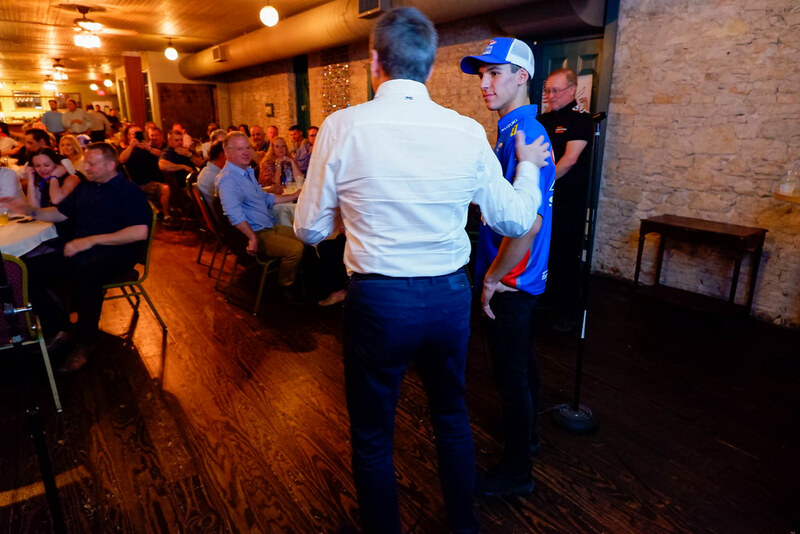 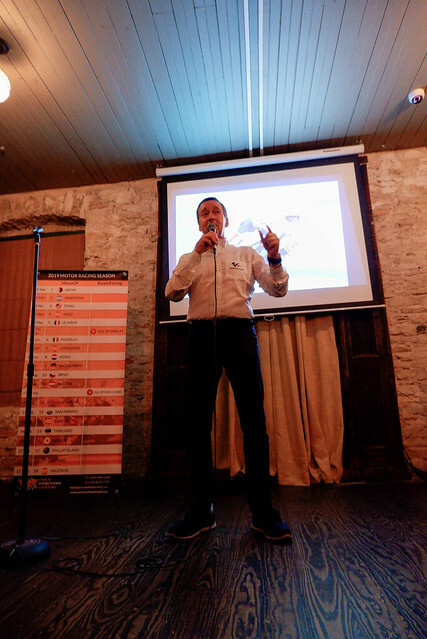 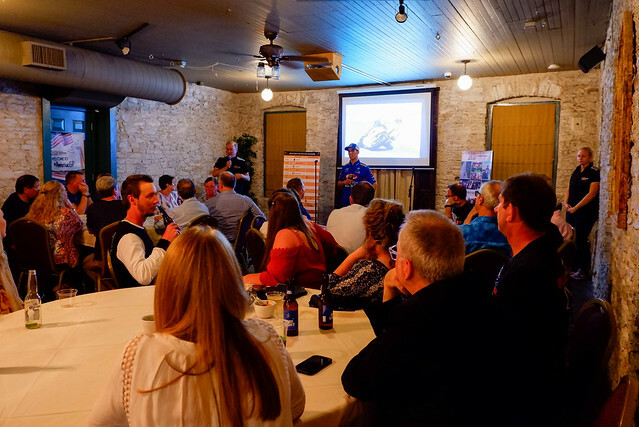 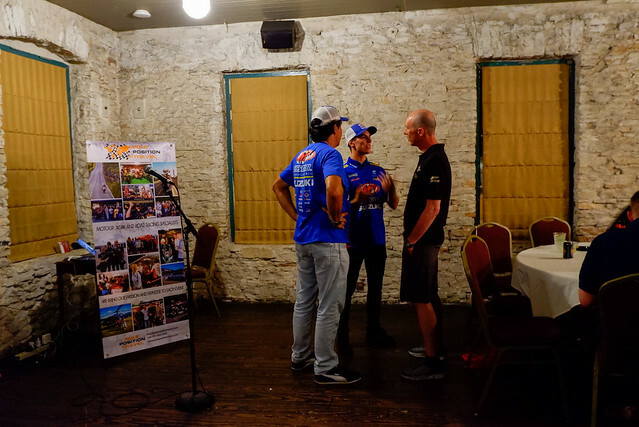 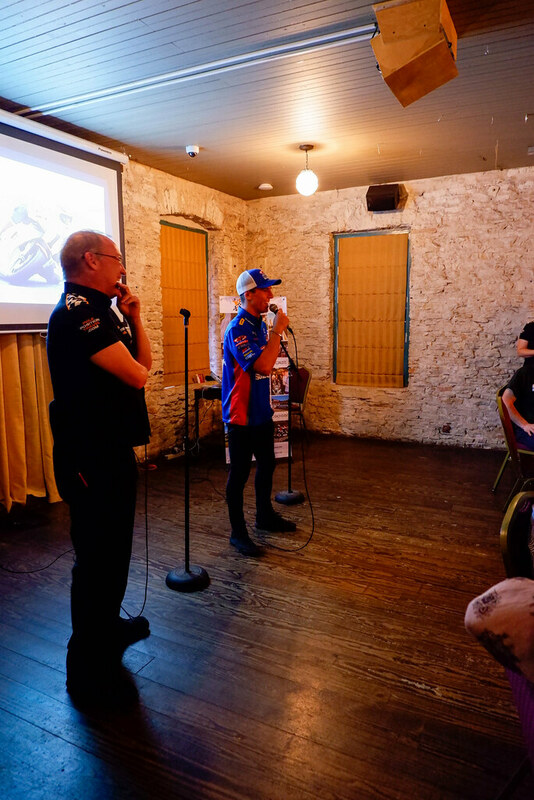 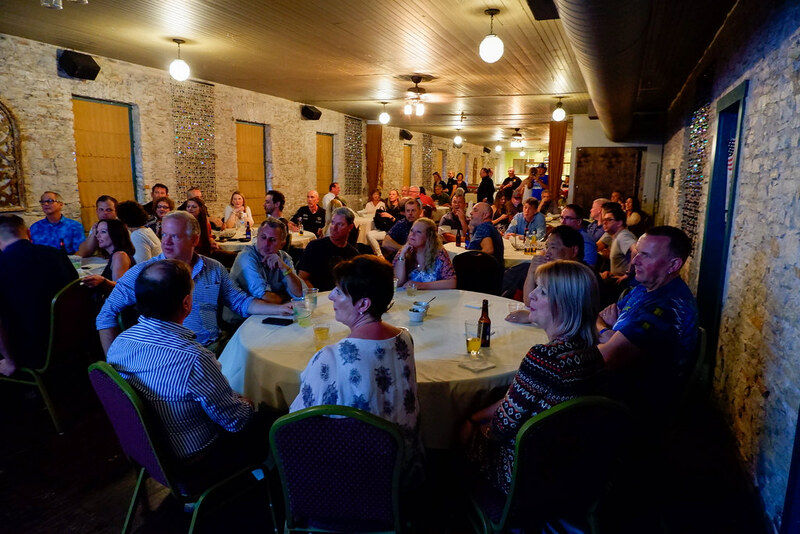 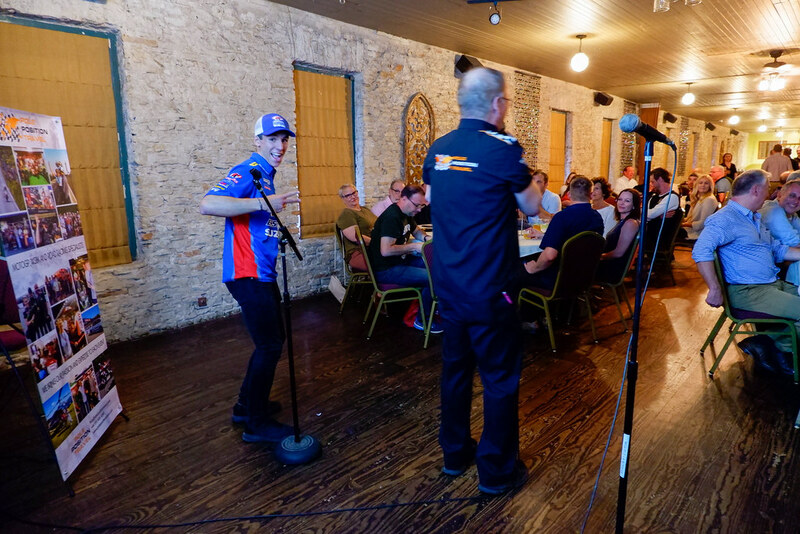 Freddie gave a humorous and insightful story of his racing career and answered numerous questions about his views and experiences of MotoGP past and present. 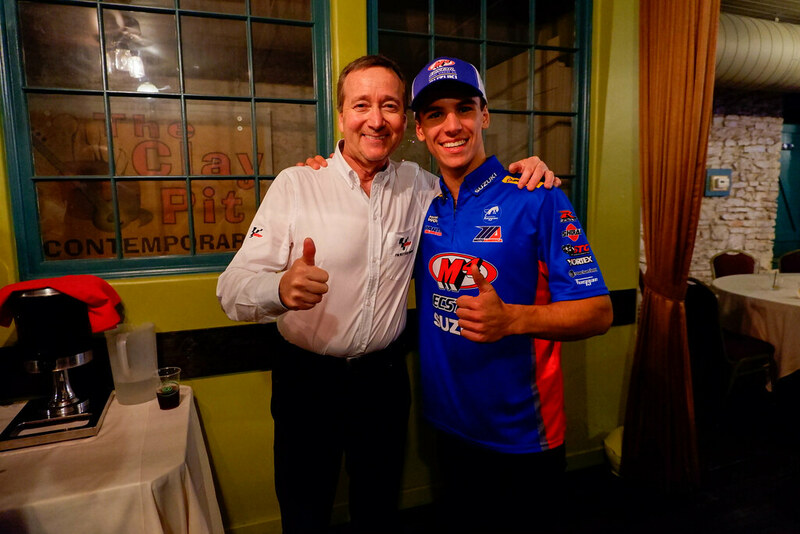 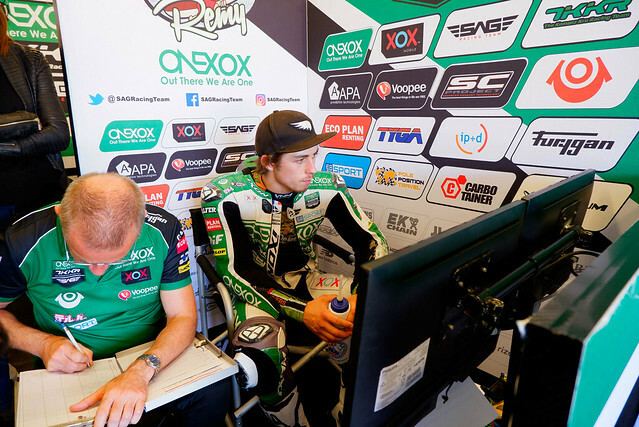 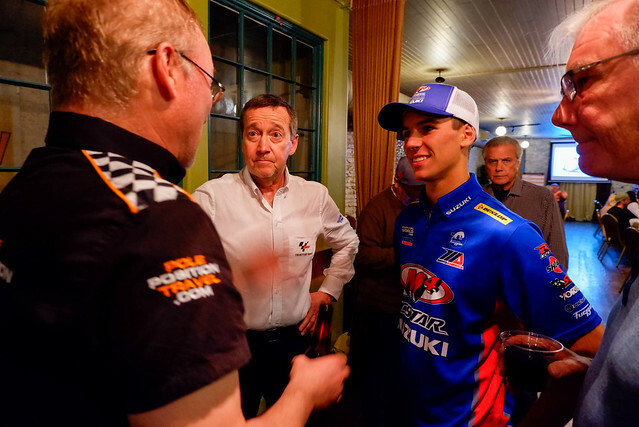 We also brought up our formerly sponsored American Red Bull Rookie and now MotoAmerica ace Sean Kelly, who gave a fascinating counter-point from the other end of a career! 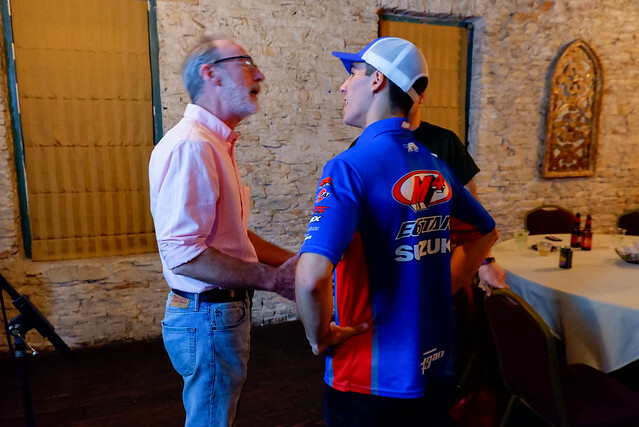 Sean (and his dad!) were of course honoured to meet and get advice from Freddie! 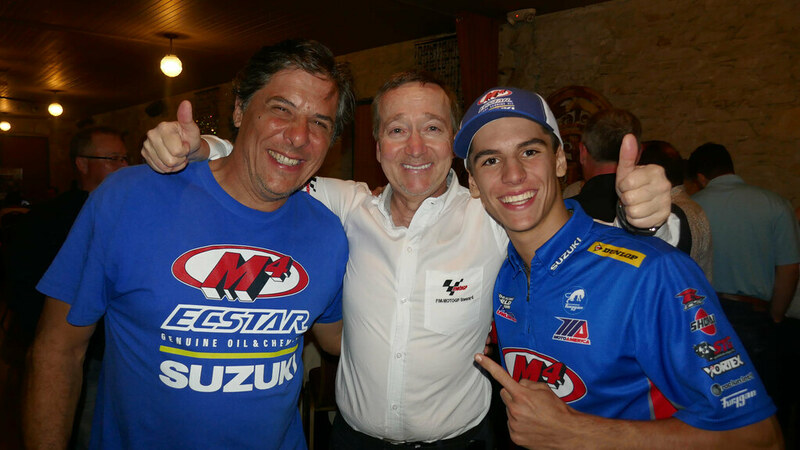 Another of the old horses still in the business joined us - world leading MotoGP journalist Manuel Pecino. 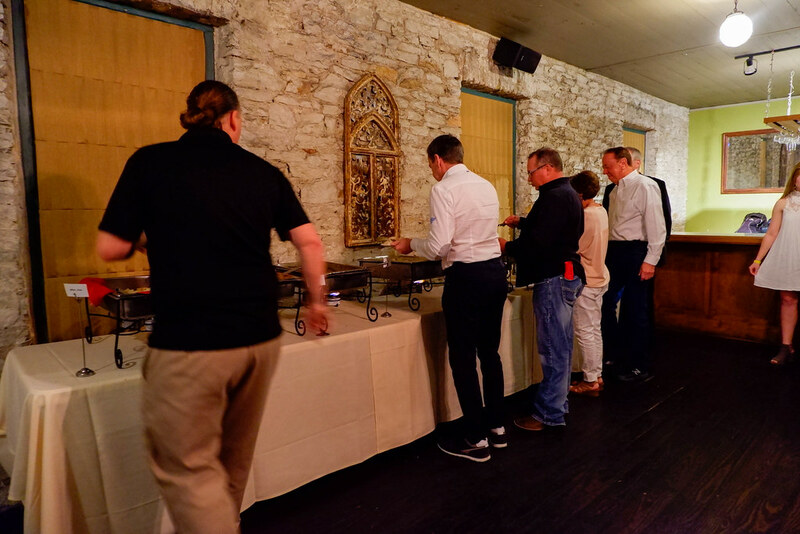 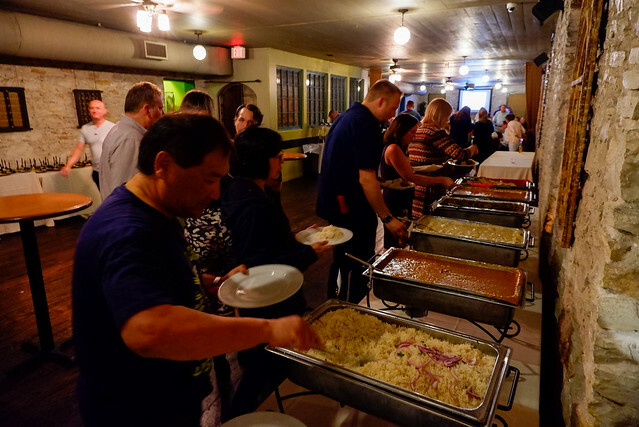 With the extensive Q&A and char around the room, it is a wonder we found time to eat! Saturday morning was a literal washout, the track itself was closed to guests for fear of lightning. 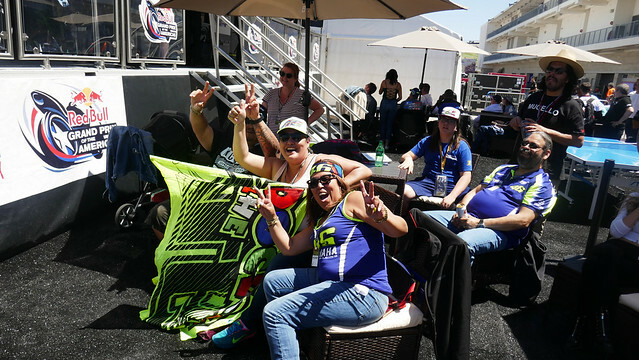 Fortunately, most of our customers were VIP (we were by far the largest group in the VIP Village) or Team Experience, those that weren't we brought into the paddock anyhow with our team passes; and we all enjoyed a morning of no track action -- leaving us free to stalk our favourite riders! 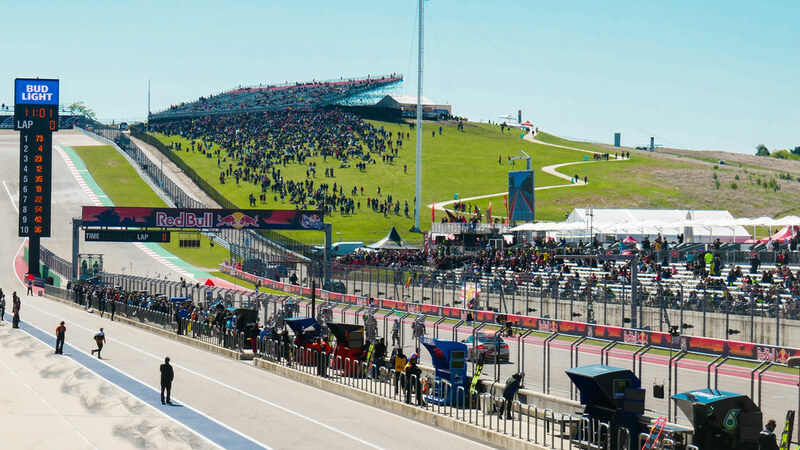 Sunday we were treated to perfect weather and the best COTA had to offer. 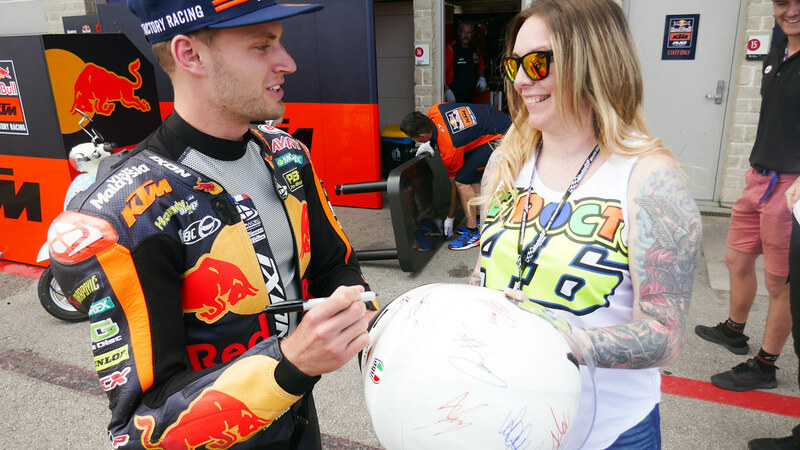 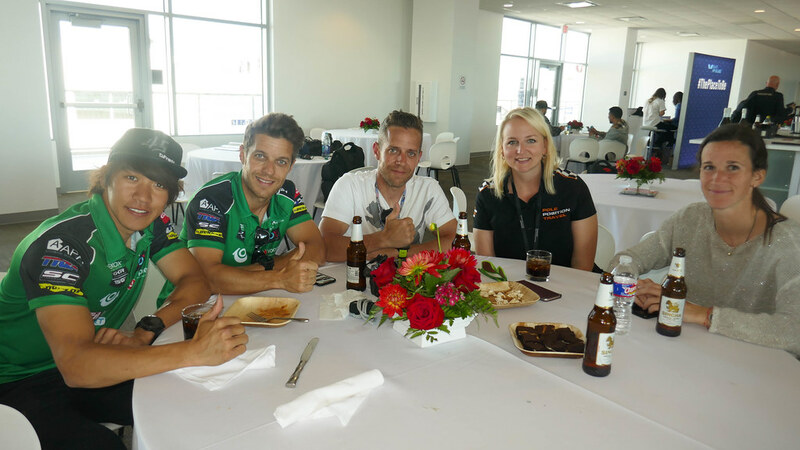 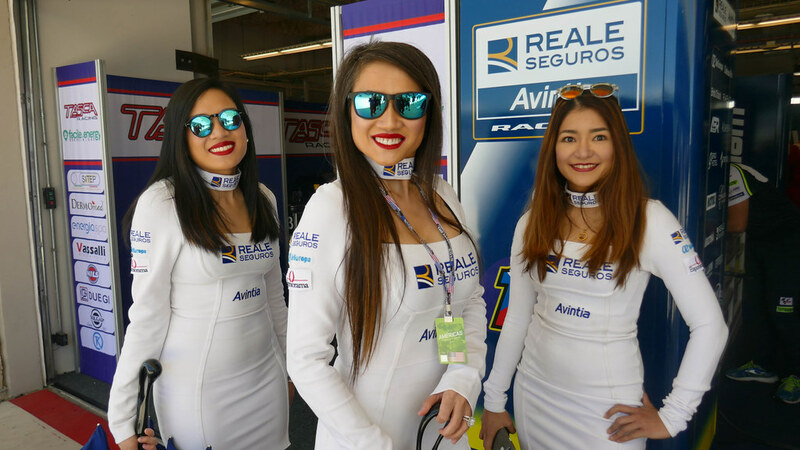 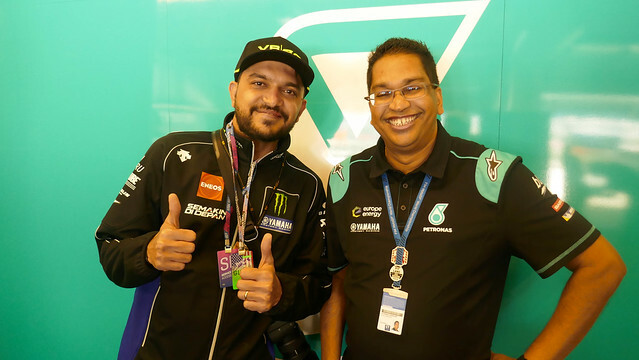 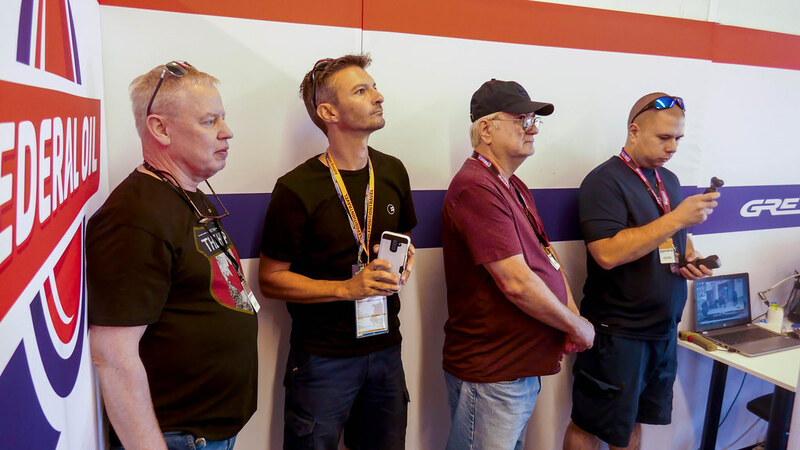 The VIP suite was up to the usual top standards, and for our VIP "Team Experience" customers we were able to carry on with MotoGP garage visits and walks on to the service road to see the bikes up close. Some of our Platinum customers even got scooter tours of the track! 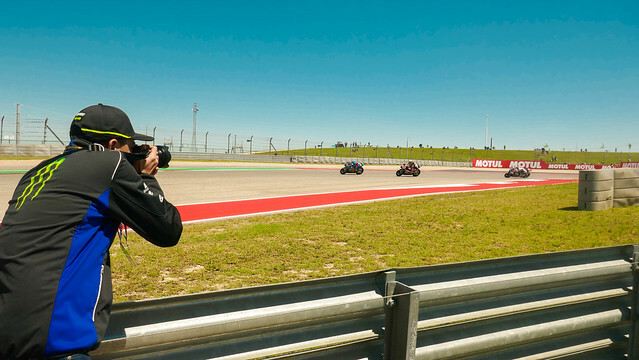 WHile we all had great views in this wide open circuit, these same Platinum guests were treated to a very special view: up close and ON the MotoGP grid! 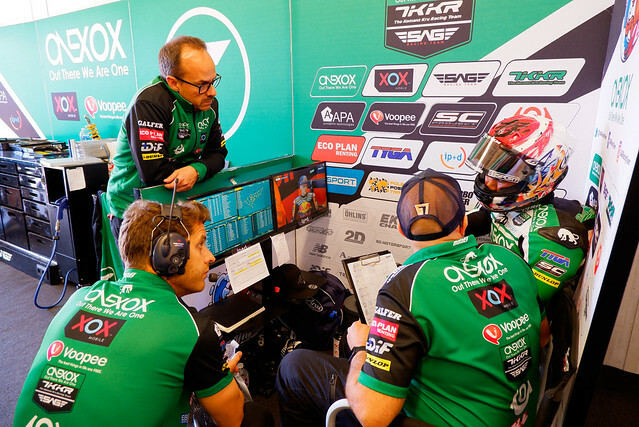 All the races were sensational, however it has been our experience that the most exciting contests have been in Moto3 and Moto2. 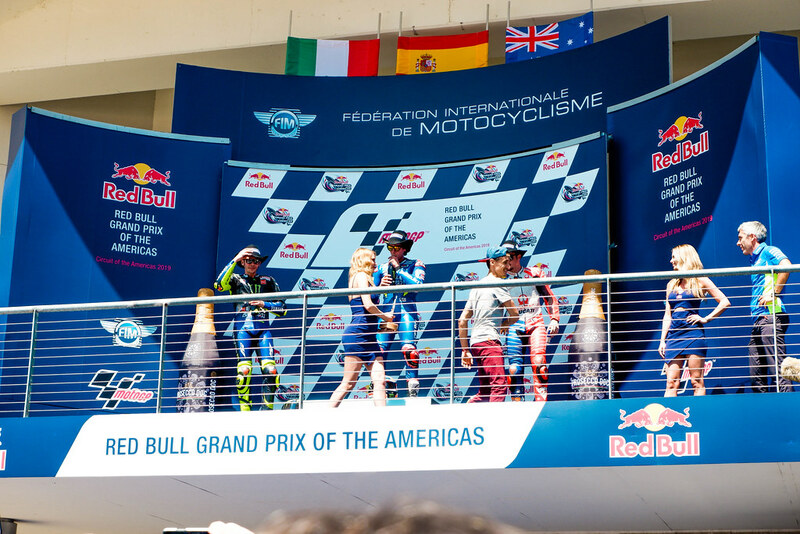 While these WERE great, happily the star of the day was the MotoGP race. 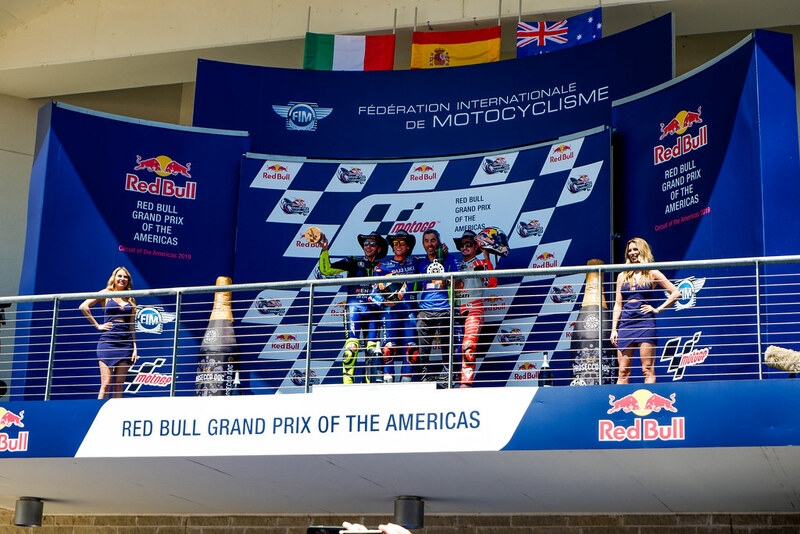 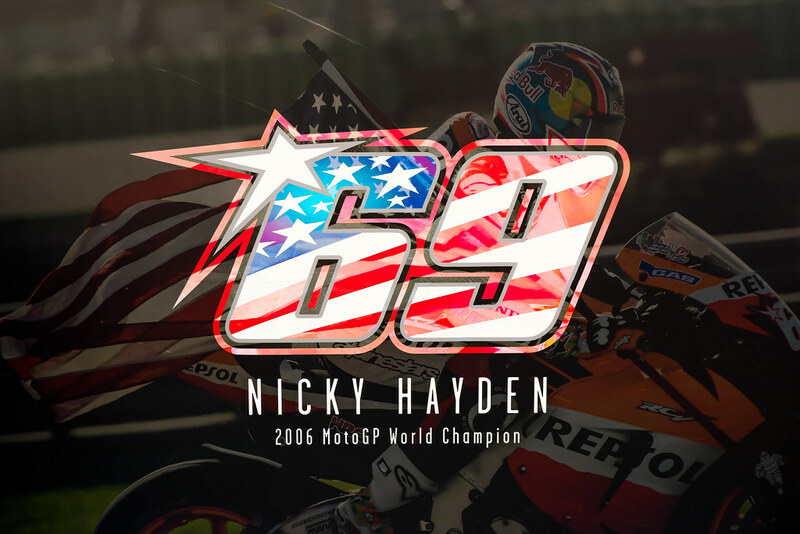 With the insanely unexpected crash of Marquez while he was dominating the event, we were treated to a brilliant contest, ending up with a duel between young gun Alex Rins on the Suzuki and the old great, Valentino Rossi, looking for his first win in 2 years. Well, he didn't quite make it, but leaving him 2nd in the championship is no bad result, and of course we were all delighted with Alex's maiden victory and a sure sign the Suzuki is now in the top class. 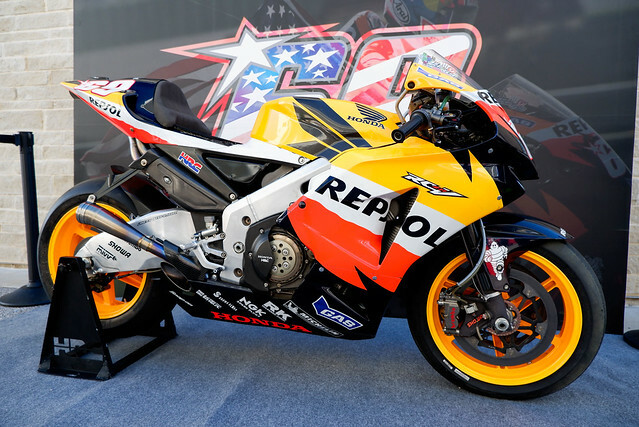 A bad day for Honda sadly, as in addition to Marc's crash, Lorenzo's bike quit, Cal crashed, and left just Taki Nagagami as the sole Honda finisher. 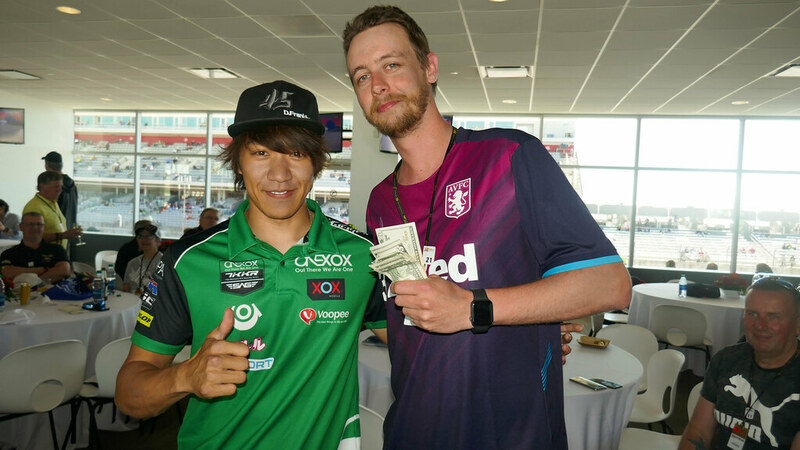 While were were all delighted with the spectacle, one man in particular was especially happy: Josh was the only person in our VIP group to correctly predict rookie Fabio Quartararo for 7th place, winning the big pot! 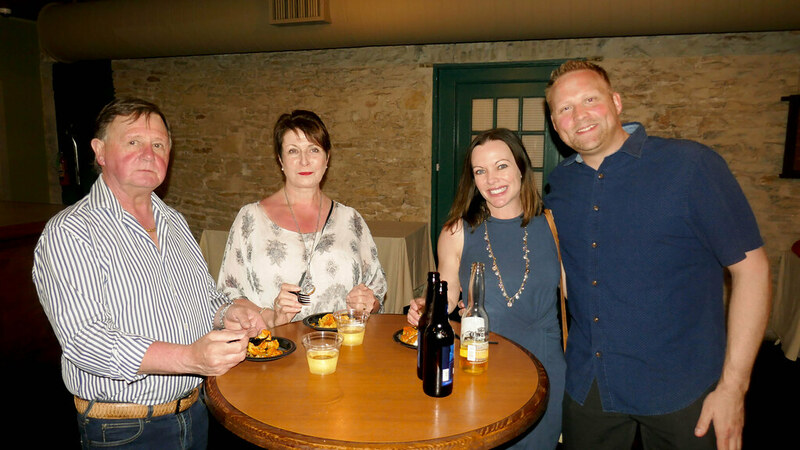 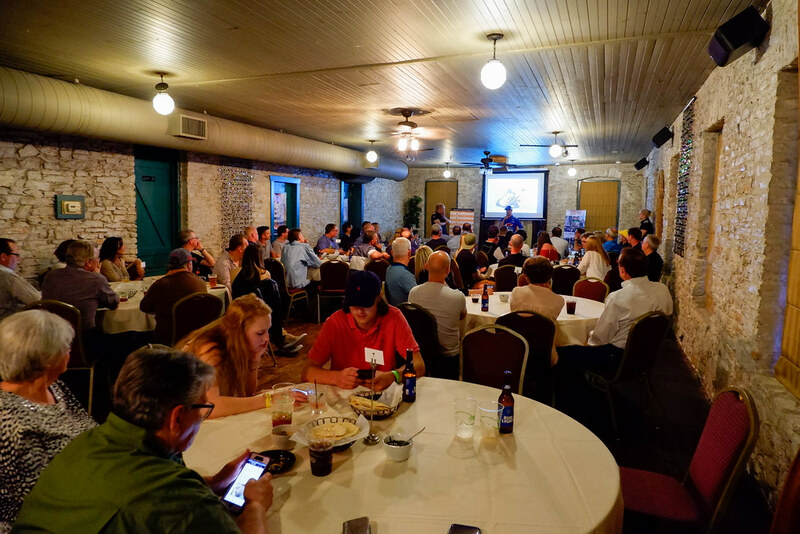 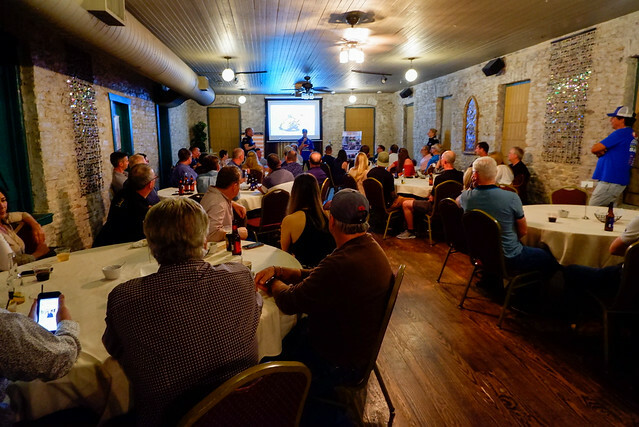 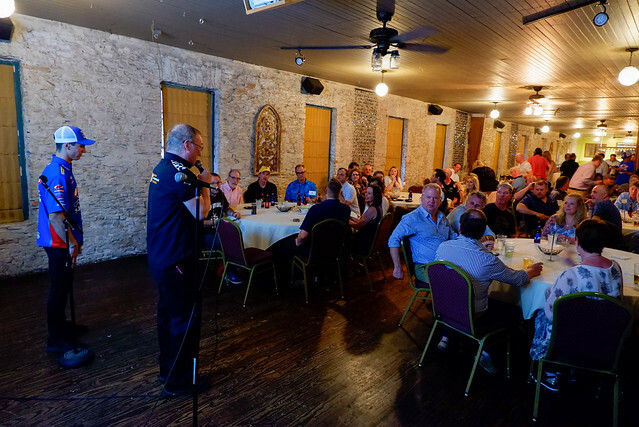 We are always sorry to part from the warm Texas weather and hospitality! 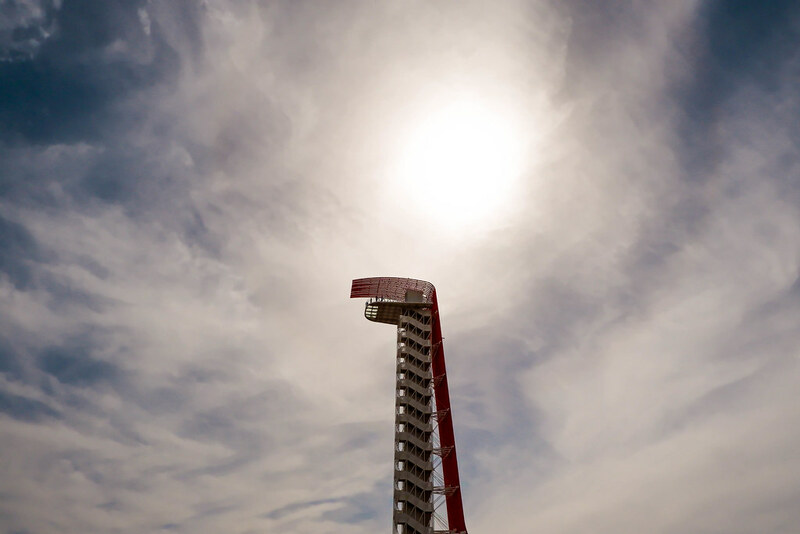 Look for us in 2020 with a larger suite and even more thrills and unique excitement!